A sustainable packaging solution, the new Snap Pack holds Carlsberg Expørt cans together in a multipack form with small pieces of a specially developed glue in small dots, which are easily snapped apart when required, but robust enough to stand up to handling to and from the store. Mr Stuhlmann, who works for one of Carlsberg's design partners, said: "The starting point was going to a hardware shop and buying all the adhesive I could get, all the glue that was there". The company claims its new packaging is a world first and will reduce the amount of plastic used by 75 per cent. "To reduce waste, we're introducing our new snap pack, which uses a revolutionary glue technology". Liam Newton, VP marketing, Carlsberg UK, added: "We're incredibly proud to launch the new Snap Pack; we've been working on this innovation for the last three years as we continue to search out ways to be better as a business". "It's a little bit of magic". The World Wildlife Fund (WWF), is a big fan of this new development and has hailed it as a "big step" in efforts to tackle the deteriorating situation regarding plastic pollution. But now, Carlsberg has unveiled a completely new solution... literally sticking the cans together with glue. Ducks, birds, and sea life can become trapped in the plastic ring pulls if they are not separated after use. "It's nearly not there, and that is what is extremely exciting from a sustainability perspective", head of sustainability at Carlsberg, Simon Boas Hoffmeyer, told the Press Association. Bo Oksnebjerg, secretary-general of WWF Denmark said in a press release that, "our wildlife is drowning in plastic". "We therefore need to act now". 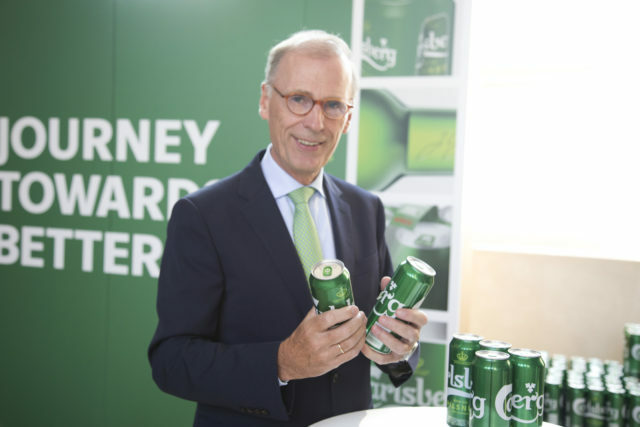 Cees 't Hart, CEO of the Carlsberg Group, said:"Carlsberg's Snap Pack will significantly reduce the amount of plastic waste and we look forward to giving our consumers better beer experiences with less environmental impact".